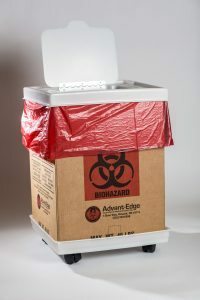 Do you need a custom liner or box for the management of your regulated medical waste? Contact our compliance team today for a proposal! The staff at ASI are experts in the management of regulated medical waste and the packaging requirements that face shippers of this hazardous material. Proper packaging of regulated medical waste ensures that the waste remains contained during storage, loading, transport, unloading and treatment. It is important to utilize proper packaging to eliminate exposure to the waste of those that will handle it after it has been packaged. The packaging of med waste always is the responsibility of the generator, even if utilizing supplies from your transporter. Generators of regulated med waste are required to comply with the requirements of the Federal Code of Regulations. Regulated medical waste packaging is found in 49 CFR 173.197. These regulations impose the requirement to utilize proper packaging upon the generator of the regulated medical waste. This responsibility always remains with the generator of the waste being shipped. We have provided design and technical guidance to various government agencies and medical institutions that utilize custom packaging to make sure the packaging complies with the requirements of 49 CFR 173.197. Medical waste packaging is typically two levels, inner and outer packaging. The inner package is the liner and the outer package is the box or container. The inner and outer packaging have specific standards that must be met to be considered compliant. We can work with your facility to make sure you are utilizing the proper liners and containers to ship your regulated medical waste. Contact us today to discuss your regulated medical waste packaging needs!